Here we see the A Mon Seul Desir tapestry. The tapestries known as the "Lady and the Unicorn" tapestries were rediscovered by French historian and archeaologist, Prosper Merimee, in 1841, in Boussac castle in central France. At the time they were damaged by their conditions of storage. The novelist George Sand, a lover of Chopin, wrote of these tapetsries in her works, and brought public interest to these works. 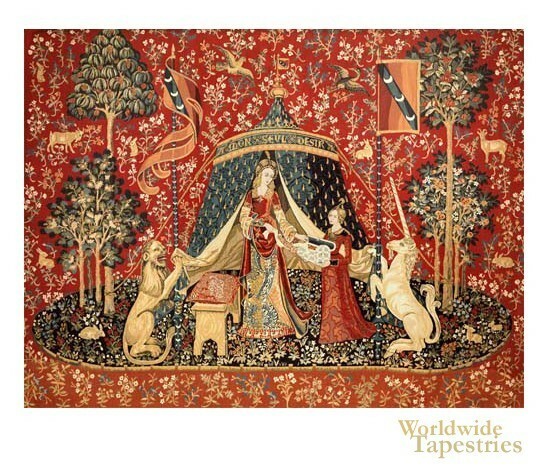 The tapestry series is currently kept in the Musee de Cluny in Paris since the year 1882. This piece is known as "A Mon Seul Desir" or my one sole desire or love desires only beauty of soul, is a work which is one of the most controversial and varied when it comes to interpretation. Here in this tapestry, we see the Lady placing her necklace, which we see her wearing in the other tapestries, into a chest. It is thought that this represents her dedication to her soul's beauty instead of a fixation on her other five senses. The ever present lion and unicorn flank the Lady and are holding the entrance to her tent open. In true Mille Fleur style, we see flowers and forest animals such as rabbits, deer and birds decorating the background. This unicorn tapestry "A Mon Seul Desir I" is backed with a lining and has a tunnel for easy hanging. Dimensions: W 62" x H 50"